Granular corneal dystrophy (GCD), an IC3D category 1 dystrophy, is an autosomal-dominant, bilateral, noninflammatory condition that results in deposition of discrete, irregularly shaped opacities in the cornea by adulthood. It specifically affects the middle portion of the cornea (stroma) and can eventually cause decreased vision and eye discomfort. There are two clinically separate types: granular corneal dystrophy type 1 (classic type) and granular corneal dystrophy type 2 (Avellino corneal dystrophy), which tends to have fewer corneal deposits, potentially resembling a combination of lattice corneal dystrophy and granular corneal dystrophy. Severe cases of granular dystrophy can be treated with either excimer laser ablation or by replacing cornea (corneal transplant). An example is shown in the image below. Granular dystrophy. Image courtesy of James J Reidy, MD, FACS, Associate Professor of Ophthalmology, State University of New York, School of Medicine & Biomedical Sciences, Buffalo, New York. The cornea is the clear outer coat of the front of the eye. 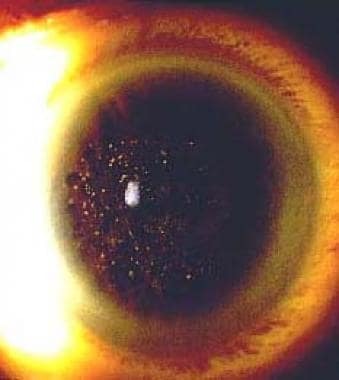 A dystrophy of the cornea is defined as a bilateral noninflammatory clouding of the cornea. Corneal dystrophies can be divided into 3 categories based on their location within the cornea, as follows: (1) anterior corneal dystrophies affect the corneal epithelium and may involve the Bowman layer, (2) stromal corneal dystrophies affect the central layer of cornea (the stroma), and (3) posterior corneal dystrophies involve the Descemet membrane and the endothelium. Granular corneal dystrophy is a stromal dystrophy, but the epithelium and Bowman layer may be affected in late disease. The age of onset for most corneal dystrophies is before 20 years (exceptions include map-dot-fingerprint dystrophy and Fuchs corneal dystrophy). Most corneal dystrophies are inherited in a dominant pattern. Exceptions include macular corneal dystrophy, type-3 lattice dystrophy, and the autosomal-recessive form of congenital hereditary endothelial dystrophy. Granular corneal dystrophy types I and II result from mutations in the TGFBI (BIGH3) gene. [1, 2] Depending on the specific mutation in the TGFBI gene, phenotypes of corneal dystrophy may differ. [3, 4] R124H and R555W are mutation hotspots of the TGFBI gene. [5, 6] The R124H mutation of TGFBI is highly correlated with granular corneal dystrophy type 2 (GCD2). Although granular corneal dystrophy type 2 is more common than granular corneal dystrophy type 1 in the United States, both are rare. Corneal changes generally first become visible during the second decade of life, but vision may not be affected until the fourth to fifth decade of life. Eye pain from recurrent corneal erosions also can occur. No sexual predilection has been reported. The prognosis of granular corneal dystrophy is good, with symptomatic patients being eligible for either laser phototherapeutic keratectomy (PTK) or corneal transplant. Grunauer-Kloevekorn C, Brautigam S, Wolter-Roessler M. Molecular genetic analysis of the BIGH3 gene in lattice type I (Biber-Haab-Dimmer) and granular type II (Avellino) corneal dystrophy: is indirect mutation analysis for hot spots recommended?. Klin Monatsbl Augenheilkd. 2005 Dec. 222(12):1017-23. [Medline]. Choi SI, Kim BY, Dadakhujaev S, Oh JY, Kim TI, Kim JY, et al. Impaired autophagy and delayed autophagic clearance of transforming growth factor ß-induced protein (TGFBI) in granular corneal dystrophy type 2. Autophagy. 2012 Sep 20. 8(12):[Medline]. Cho KJ, Mok JW, Na KS, Rho CR, Byun YS, Hwang HS, et al. TGFBI gene mutations in a Korean population with corneal dystrophy. Mol Vis. 2012. 18:2012-21. [Medline]. [Full Text]. Kannabiran C, Klintworth GK. TGFBI gene mutations in corneal dystrophies. Hum Mutat. 2006 Jul. 27 (7):615-25. [Medline]. Zeng L, Zhao J, Chen Y, Zhao F, Li M, Chao-Shern C, et al. TGFBI Gene Mutation Analysis of Clinically Diagnosed Granular Corneal Dystrophy Patients Prior to PTK: A Pilot Study from Eastern China. Sci Rep. 2017 Apr 4. 7 (1):596. [Medline]. Choi SI, Kim TI, Kim KS, Kim BY, Ahn SY, Cho HJ, et al. Decreased catalase expression and increased susceptibility to oxidative stress in primary cultured corneal fibroblasts from patients with granular corneal dystrophy type II. Am J Pathol. 2009 Jul. 175 (1):248-61. [Medline]. Choi SI, Lee E, Akuzum B, Jeong JB, Maeng YS, Kim TI, et al. Melatonin reduces endoplasmic reticulum stress and corneal dystrophy-associated TGFBIp through activation of endoplasmic reticulum-associated protein degradation. J Pineal Res. 2017 Oct. 63 (3):[Medline]. Ahn JH, Kim HD, Abuzar SM, Lee JY, Jin SE, Kim EK, et al. Intracorneal melatonin delivery using 2-hydroxypropyl-β-cyclodextrin ophthalmic solution for granular corneal dystrophy type 2. Int J Pharm. 2017 Aug 30. 529 (1-2):608-616. [Medline]. Sakimoto T. Granular corneal dystrophy type 2 is associated with morphological abnormalities of meibomian glands. Br J Ophthalmol. 2015 Jan. 99 (1):26-8. [Medline]. Lewis DR, Price MO, Feng MT, Price FW Jr. Recurrence of Granular Corneal Dystrophy Type 1 After Phototherapeutic Keratectomy, Lamellar Keratoplasty, and Penetrating Keratoplasty in a Single Population. Cornea. 2017 Oct. 36 (10):1227-1232. [Medline]. Mori H, Miura M, Iwasaki T, et al. Three-dimensional optical coherence tomography-guided phototherapeutic keratectomy for granular corneal dystrophy. Cornea. 2009 Sep. 28(8):944-7. [Medline]. Dalton K, Schneider S, Sorbara L, Jones L. Confocal microscopy and optical coherence tomography imaging of hereditary granular dystrophy. Cont Lens Anterior Eye. 2009 Nov 27. [Medline]. Ashar JN, Latha M, Vaddavalli PK. Phototherapeutic keratectomy versus alcohol epitheliectomy with mechanical debridement for superficial variant of granular dystrophy: A paired eye comparison. Cont Lens Anterior Eye. 2012 Oct. 35(5):236-9. [Medline]. Jung SH, Han KE, Stulting RD, Sgrignoli B, Kim TI, Kim EK. Phototherapeutic Keratectomy in Diffuse Stromal Haze in Granular Corneal Dystrophy Type 2. Cornea. 2012 Apr 21. [Medline]. Rathi VM, Taneja M, Murthy SI, Bagga B, Vaddavalli PK, Sangwan VS. Phototherapeutic keratectomy for recurrent granular dystrophy in postpenetrating keratoplasty eyes. Indian J Ophthalmol. 2016 Feb. 64 (2):140-4. [Medline]. Taneja M, Rathi VM, Murthy SI, Bagga B, Vaddavalli PK. Femtosecond Laser-Assisted Anterior Lamellar Keratoplasty for Recurrence of Granular Corneal Dystrophy in Postkeratoplasty Eyes. Cornea. 2017 Mar. 36 (3):300-303. [Medline]. Lang SJ, Eberwein P, Reinshagen H, Reinhard T, Sundmacher R. Simultaneous transplantation of limbal stem cells may reduce recurrences of granular dystrophy after corneal transplantation: 2 long-term case reports. Medicine (Baltimore). 2015 May. 94 (20):e789. [Medline]. Jung SH, Han KE, Sgrignoli B, Kim TI, Lee HK, Kim EK. Intraocular lens power calculations for cataract surgery after phototherapeutic keratectomy in granular corneal dystrophy type 2. J Refract Surg. 2012 Oct. 28(10):714-24. [Medline]. Klintworth GK. Advances in the molecular genetics of corneal dystrophies. Am J Ophthalmol. 1999 Dec. 128(6):747-54. [Medline]. Krachmer J. Cornea. Vol 2: 1996. Yamamoto S, Okada M, Tsujikawa M, et al. The spectrum of beta ig-h3 gene mutations in Japanese patients with corneal dystrophy. Cornea. 2000 May. 19(3 Suppl):S21-3. [Medline]. The slit lamp parallelipid demonstrates the deposition of opacities throughout the central stroma.